Is the Earth’s Electromagnetic Field Soon to Flip? 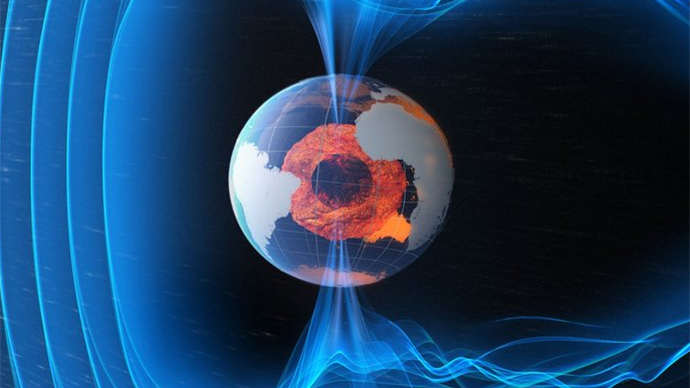 The Earth’s magnetic field, which protects us from radiation from space, is getting weaker. We don’t yet know why this is, but new evidence confirms it is happening unevenly across the planet with some areas getting more protection. A polarity flip, or drastic weakening would not be lethal, as demonstrated by the fact that past changes have not been associated with mass extinctions, but could expose powerlines and communication systems to much greater danger. On the positive side, auroras should become more spectacular and widespread. Should such an event occur, most scientists anticipate the timescale will be of the order of millennia, rather than decades, making the Daily Mail’s call to “forget global warming and start worrying about the Earth’s magnetic field” typically stupid.